I like cakes that are easy to make and this one definitely fits the bill. There are no complicated steps and you don’t have to spend hours or days decorating. You don’t even need a mixer to make this cake, you can whip it up by hand! I love my KitchenAid Mixer to pieces, but sometimes it’s nice to do it the old fashioned way. The cake calls for sour cream, but I usually use plain Chobani Greek yogurt since we always have it on hand. It produces a lovely cake as well. Use whatever is in your fridge. I like to use Dutch processed cocoa for a deeper chocolate flavor. Break out the good stuff for this cake, it’s worth it! This cake is very rich and a small piece usually does it, but since it’s my birthday I think I need a big fat piece…for breakfast:) Starting my birthday with chocolate cake must mean it’s going to be a great year. At least that’s what I’m going with. We shall see! At least I know my day will be wonderful! This Chocolate Sour Cream Bundt Cake is perfect for any celebration or just because you need chocolate. I am a firm believer that every day should be celebrated and there is no better way to celebrate than with chocolate. And if you want to make your Valentine’s heart go pitter patter, just give them a slice of this cake. 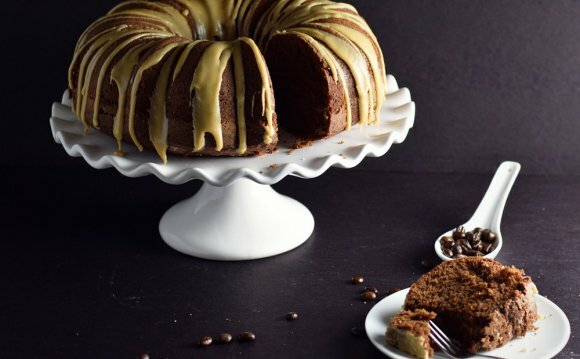 Everything will be smooth sailing after they taste this Chocolate Sour Cream Bundt Cake! If you are looking for the perfect chocolate cake recipe, you've found it! You will need a glass of milk to wash down this rich and chocolaty cake!